If samosas with interesting stuffings such as chicken kheema, kadai paneer or even chocolate appeal to you, you should check out Samosa Singh in Electronic City. We like our samosas with spicy masala aloo stuffing and for us, it’s the perfect snack (or even a meal). Naturally, our interest was piqued when we heard that a small self-service restaurant out in the wilderness of Electronic City was serving samosas with a twist. The twist is that they experiment with different kinds of stuffing — paneer tikka to chicken kheema. Yup, your everyday aloo samosa, the street food staple, gets upgraded with stuffings that can certainly qualify you as an adventurous eater. Unlike the samosas you get from your nearby chaat shop, these come with a thicker outer shell made of either maida or wheat. We tried the Chicken Kheema, Tadka Onion, and Aloo Masala samosas, with the Chicken being the best of the three. The onion samosa left us craving for the crunchy ones that you get at Savera in Shivajinagar. Luckily the aloo was there to save the day with its punchy masala stuffing. 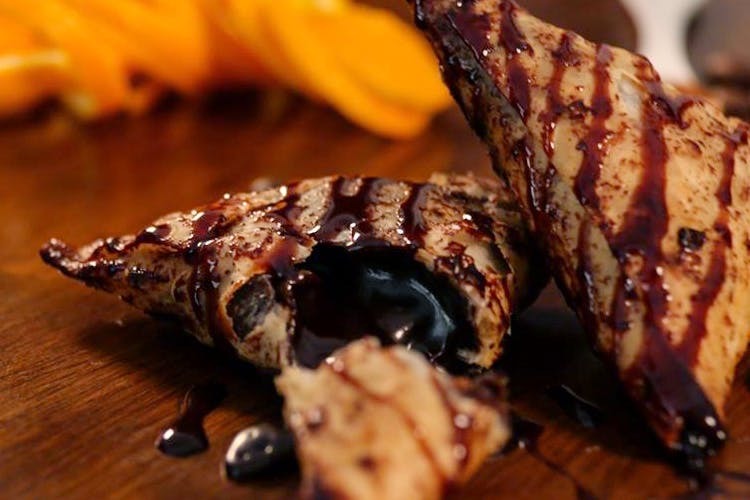 The signature samosa at Samosa Singh is Chocolate samosa or Chocossa as they call it. Mildly surprised, but then again we live in a world where Chocolate Pani Puri is a thing, we gave the Crunchy Peanut Chocossa a shot. Too sweet for many, not for us, it’s one of those things that can be a hit or a miss. A definite hit for us, it did wash down all the masalas from the samosas before. Since it’s the mango season, they have something called Mangossa too which is samosas stuffed with mangoes. Try and tell us how it is in the comments below?